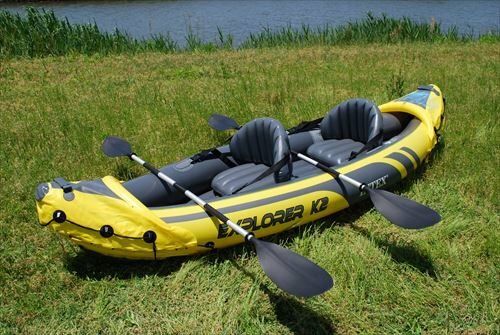 The Intex Explorer K2 Kayak is a nicely built two man inflatable boat which is ready to use right out of its box. 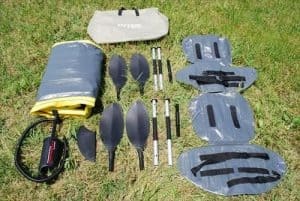 The storage bag can easily fit the kayak, patch kit, paddles and Hand Pump, and the entire package will be light enough for one person to carry from the vehicle to the water. Made out of 30 gauge rugged vinyl and sporting a robust I beam floor construction, this vessel provides the best comfort and convenience on mild rivers as well as lakes. 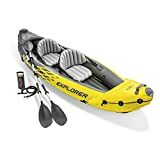 Thanks to the removable skegs that come with this kayak, it can track well in any depth of water and some people have reported that this intex kayak works for Class II and III rivers too! Keep in mind that the paddles that come with it aren’t meant for whitewater so if you intend to try the boat out in whitewater, get sturdier paddles. 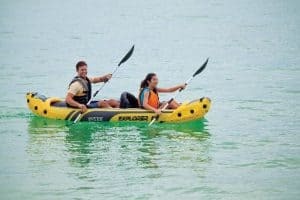 What makes the Intex Inflatable Kayak such a good buy? Thanks to two separate air chambers, made in a way that if one fails, the other one can keep the boat afloat, you have added reliability and better weight carrying capacity – the Explorer K2 can easily carry two people but you can sail it solo just as well if you put your gear in front to balance the load. You can even take your dog out on it for a fun kayaking adventure! You can use this kayak for fishing, too, even though it isn’t primarily a fishing vessel. There is an absence of rod holders but the plentitude of ring connectors can be used for rigging bungee loops that can serve as makeshift holders. The striking yellow color of the kayak as well as the way it rides the water has made it safe enough to be commended by the US Coast Guard. The problem lies in its black bottom however, which can absorb sunlight and buckle – although it won’t affect performance, the kayak won’t lie flat on the ground afterwards. Rugged vinyl construction makes it possible to take this kayak even in somewhat rough water conditions. Tracks well thanks to removable skegs. Recognized by the US Coastguard for safety and reliability. Easy mobility due to 36 lbs. weight and conveniently fits in a storage bag. Comes with own repair kit to quickly deal with punctures. The black bottom of the kayak can buckle if kept in the sun which can prevent the kayak from lying flat on the ground ever again. The paddles that come with it are not that durable and certainly not great for whitewater. If you’re looking for an affordable, reliable and attractive kayak, then this vessel will be your best bet. You can easily retrofit it into a fishing craft or have fun kayaking with a friend/loved one or even a pet. The recognition by the US Coast Guard should dispel any doubts about this vessel’s safety and reliability.